What DRBG Config Should I Use ? I am happy finally publishing this post, which I want to write since Java 9 is released in 2017. I aim to show you the details of SecureRandom in Java, not from a cryptographer perspective, but to become a well-informed developer. I will also demonstrate you an alternative, or complementary, widely available hardware based solution, Intel® Secure Key. All I discuss below can be applied to production systems, none of them are experimental or just for testing. However, this post is informative only and I assume no liability. If you need commercial support, please get in touch with me or with my company. Random numbers are needed very often, especially now where cryptography is everywhere. A simple example is every time you visit an HTTPS site, many random numbers are needed. Consider flipping a coin as our random number generator, which will generate a sequence of heads (H) and tails (T). We need a large amount of random numbers today either because of cryptography or applications such as gaming and monte carlo simulation, and it is actually very difficult to generate “true random” numbers. True randomness means it is an essential property, thus algorithms, being deterministic in nature, cannot generate true random numbers. True randomness needs a physical phenomena with inherent randomness, such as quantum or thermal phenomena. The difficulty of this comes from the fact that because we need to measure something from a physical phenomena, it usually takes time to do such measurements and collect the samples. As a result, such (true) random numbers are generally not used directly but used as an entropy source for deterministic random number generation algorithms which are much faster. In order to distinguish two, the output of such an algorithm is called pseudo random numbers. There are a few practical sources for true randomness. It can be a quantum phenomena, such as shot noise, nuclear decay, photons/optics, or thermal phenomena, such as thermal or avalanche noise. There are many such products that can measure something and gives you true random values, including simple and cheap ones, and I do not mean they are bad. For example, TrueRNG V3 - USB Hardware Random Number Generator measures the avalanche noise generated on a diode. I have used a similar product, Entropy Key, for years without any problem. Another example, Intel® Secure Key, is a technology where a true randomness source and a measurement system forming a random number generator is integrated into the processor. where $X_0$ is the seed and its value is a fixed value XORed with System.nanoTime(), and $X_n$ are successive random numbers. This is a no-no for cryptograhpy, since, for example, we can generate two keys, and we expect knowing one will not make it possible to guess the second. For cryptographically strong random number generation, there are different algorithms and java.security.SecureRandom uses such methods. This may not be obvious but actually Random and SecureRandom are implemented very differently, in the sense that Random is a concrete class, implemented as I described above, on the other hand, SecureRandom (which extends Random) uses different providers, instances of SecureRandomSpi, for the actual implementation of such algorithms. Thus, saying that you are using SecureRandom may not be enough since it is not clear what algorithm you are actually using. * registered providers supplies a SecureRandom implementation. For Solaris/Linux/MacOS, it obtains seed and random numbers from /dev/random and /dev/urandom and reads securerandom.source Security property and java.security.egd System property. The default is to obtain seed from /dev/random and obtain random numbers from /dev/urandom. For Windows, NativePRNG is not implemented, but Windows native implemetation is provided using SunMSCAPI provider. If you do not know the difference between /dev/random and /dev/urandom, now it is time to learn. /dev/random is a full entropy source, meaning it only gives you truly random numbers read from physical phenomena such as your mouse movements. On the other hand, /dev/urandom is the output of a random number generator. The important thing is generation of true random numbers is a slow process. If you do a cat /dev/random, it is going to display some but then block, you can wait or for example move the mouse and you will see more data coming. Of course, this is an unacceptable situation for some/many cases, so /dev/urandom is provided for this reason. This behavior can be improved/modified, for example by installing rng-tools. So the NativePRNG actually comes in three variants. We also have SHA1PRNG. It is selected, when no PRNG algorithm is available, or based on the code above, when NativePRNG is not available. SHA1PRNG is a pure Java implementation, that may or may not use /dev/[u]random, depending on the java.security.egd System property or securerandom.source Security property. With Java 9, we now have another option, but before that we need to talk about a document. It is important to know that you need a randomness source to initialize/seed the DRBG method, thus a DRBG is actually composed of a DRBG method and a randomness source. As the name indicates, a DRBG is initializied with a seed from a randomness source, and then generates random bits with an algorithm, so it is a deterministic process. The methods defined in this document produces cryptographically secure (pseudo) random bits / numbers. However, the actual properties of a DRBG depends on the randomness source as well. Java 9 brings exactly this to Java. Java 9 introduces JEP 273, which contains the implementation of the three DRBG methods described in NIST SP 800-90A Rev. 1 publication. As you see, there is a new one called DRBG. We did not specify the details, but it selected Hash_DRBG. sun.security.provider.DRBG is the SecureRandom provider for DRBG algorithms, and actual implementations are provided in sun.security.provider. [HashDrbg, HmacDrbg, CtrDrbg] classes. The DRBG implementation in Java 9 uses the SeedGenerator as entropy input, which reads the entropy from either java.security.egd System property or from securerandom.source Security property. So by default it uses /dev/random in Linux. The security strength should be equal to maximum strength you need. For example, if you are going to use 256-bit nonce values directly from the DRBG, you should configure DRBG as 256-bit strength. The concatenation of (for example 128-bit) output does not give a higher (for example 256-bit) strength. for Hash_DRBG and HMAC_DRBG, it is the output length of the hash function, so you cannot select SHA-1 for 256-bits strength, since the output is 160-bits only. for CTR_DRBG, it is the key size of AES used. So you should use AES-256 for 256-bits strength. Reseeding is a good practice if you are going to keep the same DRBG instance for a long time. It basically re-initializes the DRBG, so any risk of leaking the seed or state of DRBG is eliminated. When possible, it is recommended the prediction resistance is requested, and prediction resistance requires reseeding. That means, when possible, pr_and_reseed should be used. The use of derivation function is optional if an approved entropy source (compliant to SP800-90B or SP800-90C) is used. Otherwise, it should be used. A derivation function is always used with Hash_DRBG and HMAC_DRBG, so this parameter (use_df) is only meaningful for CTR_DRBG. Try to find a SP800-90B or SP800-90C approved entropy source, and provide it with System or Security property. If you can find such an entropy source, request pr_and_reseed also. Do not forget to increase default security strength if you need a higher one. Here are some advices, with no liability assumed. SHA1PRNG is an old method, unless there is an obvious reason or unless you definitely know what you are doing, it should not be used in production. If you do not need a standard based approach, you may continue using NativePRNG. Be aware that the security and performance of this approach totally depends on your platform, and usually the details are hidden or hard to know. If you need compliance or total control of the process, I do not recommend this approach. If you need a standard based approach, for compliance or just to be on the safe side, use the new DRBG methods and use a proper source of entropy. Be aware that the source of entropy is not specified by Java, and the properties of DRBG is dependent on it. The easiest option is to use the platform entropy source, such as /dev/random. Under certain conditions the platform default entropy source is not enough for variety of reasons, then you should look for another solution. Keep in mind that only approved randomness sources in terms of SP800-90A are the ones conforming to SP800-90B or SP800-90C. This section actually has no direct relation with Java, but I will show how it can be used with Java. 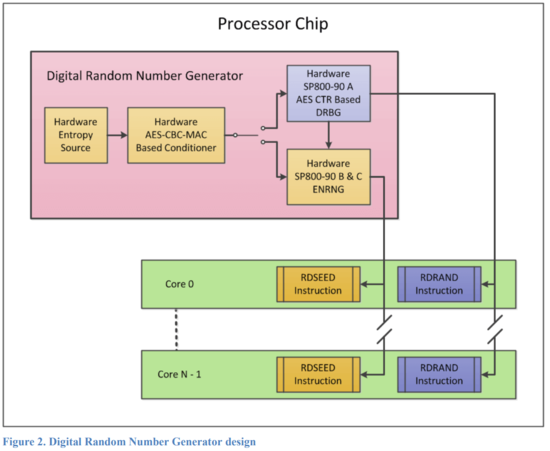 Intel® has an on-die (inside the processor) (Digital) Random Number Generator (DRNG) implementation called Intel® Secure Key. For example, this is the specs of the processor I am using, you can see the line with Secure Key. Both of the instructions can sample a 16, 32 or 64-bits value from the outputs of random number generators, and store it into a register. After RDSEED and RDRAND, the carry flag (CF) should be checked to see if the value on the register is valid. Because this DRNG is implemented inside the processor, and the entropy source has a high throughput, DRNG has a very high throughput. A low level implementation can use the instructions directly. However, it is much easier if you have a source that you can feed to applications. For that reason, I made a simple RDRAND/RDSEED character device driver for Linux, called Clarona, that can be easily used by the applications. [ 5568.446268] antelabs-clarona: Initialization done. A very high throughput (~ 50MBit/sec) can be seen for the full entropy source (RDSEED). A theoretical maximum is given in the official documentation as maximum of 100M RDRAND instruction per second. Since output can be 64-bits, 800MB/s is a possibility and the upper bound. It is mentioned that a single thread may see 70 to 200 MB/sec. Now, it is not difficult to use these in Java, it is not different than /dev/random. A simple example is what I provide in the repo, Example.java which generates 1M x 8bytes seeds. I am using generateSeed method in Example.java, the reason is NativePRNG MIXED mode uses the entropy source that can be modified only for that method, and uses /dev/urandom for other generate methods.